You've always planned to help your children save for their college educations. There's just one problem: Those kids are already in high school and you've not even managed to save enough money for a single semester. Don't panic. Saving for college can sneak up on parents who already have many other financial challenges like making monthly mortgage payments, building an emergency fund, and saving for retirement — not to mention the daily costs that come with raising children. 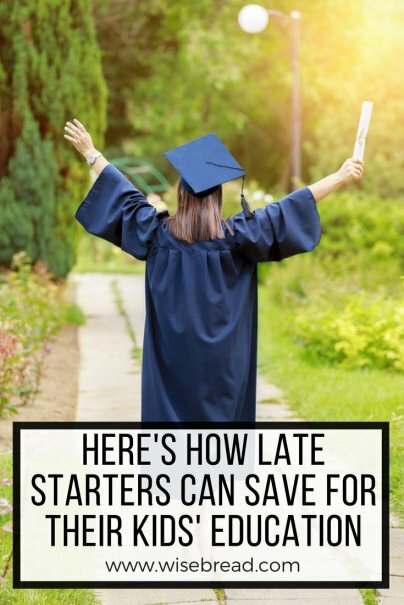 Fortunately, there are still steps you can take to boost your college saving efforts late in the game. You'll just have to be realistic: It's challenging to pay for a child's college education when you only have three or four years to do it. Setting more realistic goals can help ease your stress. And whatever you do, don't forget to have a long talk with your children. Explain to them exactly what kind of financial support they can expect. You don't want to blindside them if they think you're going to be their tuition piggy bank. The first rule is the simplest: Don't give up just because you've gotten off to a late start. Even if your child is starting high school, you can still open a 529 college savings account and contribute money to it each month. Every state in the country offers one of these plans. These plans come with tax benefits that make them ideal for saving for higher education. The money you save in a 529 plan will grow on a tax-deferred basis. You can withdraw the money without paying any taxes, too, as long as you use the dollars for qualified higher-education costs. The definition of "qualified expense" is broad here. They include tuition, of course, but also fees, books, and supplies. You might not have much money to deposit into these accounts each month, but even saving $100 a month can add up. Sure, you might not be able to save enough to cover all of your child's college costs. But you can certainly make a dent in tuition payments, fees, and expenses. You can provide an extra boost to your savings through Sallie Mae's Upromise program. Parents and students who sign up receive extra money toward college when they shop at participating retailers. These retailers deposit a percentage of what parents and students spend into a savings account designated for a future college student. It's important to keep your children informed as to how much you've saved for their college educations and how much you can reasonably expect to save before they head off to university. You don't want your children surprised that you've only saved enough to pay for two years of college when they expected you to pay for four. Have real financial conversations with your children. Work with them to create a household budget to determine how much money you can save each month for college. Doing this will give your children a more realistic look at your finances, the challenge of saving for college, and insight into how much they themselves might have to borrow. The budget might even include any money your children can add to their own college savings fund. Remind your sons and daughters that every little bit adds up, and that you expect them to help provide college savings, too. It can be tempting to save for your children's college education at the expense of putting money away for your retirement. Don't fall into this financial trap. Your number one priority should still be to stow away money for your retirement years, even if this means that you can't save as much as you'd like for your kids' education. Speaking of those other options, your children need to start exploring them. Perhaps they could attend community college for two years and then transfer to a more expensive four-year college as a junior. Or maybe your children could attend a less expensive public state university instead of that private school three states away. Both strategies could dramatically reduce the expense of a college education.